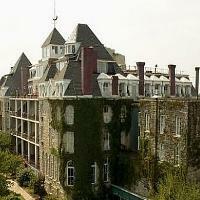 It’s Halloween season – a perfect time to explore haunted digs for your honeymoon. Haunted Rooms.com provides a listing of the best in domestic creep options. Choose from castles, lighthouses, plantations, traditional hotels and a variety of asylums. Some of the facilities offer tours to enhance the chill factor. The Crescent Hotel (shown here) escorts you to the morgue of this former hospital where you might catch a glimpse of the infamous Dr. Baker who experimented on his patients. Lodging ghosts across the country range from scorned lovers in the lobby to monks in the attic. There’s even a “hand of mystery” in Chicago. If you book the bridal suite at Thornewood Castle in WA, be prepared to share it with the former lady of the house who has reportedly been seen looking lovingly out at the garden. The user friendly website allows you to search hotels by city or state. View if you dare!